Since 1845 the family Robaina produces an excellent tobacco in his plantation Cuchillas de Barbacoa , which is located in the district of San Luis, the growing area of Vuelta Abajo. 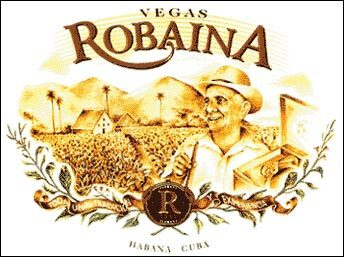 The Vegas Robaina brand was born in 1997 as a tribute to all the Cubans farmers in the figure of Alejandro Robaina , he has achieved a high yield during the years go by. In fact, in Robaina’s finca are produced the best leaves for the capa . Vegas Robaina was introduced in Spain, then it was extended to other countries. The anilla remains firmly in mind because it has an R of gold color on a brown field . Let’s talk about the formats . The first we meet is the Famosos , a hermoso 4 with cepo 48 mm.127 . A cigar is not too strong , also suitable to be smoked in the late morning . The Familiar is a corona , cepo 42 mm.142 , for smokers who enjoy elegant forms. The Clasicos is a cervante , cepo 42 for mm.165 . This cigar deserves much attention because although it is not a format that is the most popular , is an exceptional smoke . Smoke it , then tell me . Let’s talk about the big formats. Unicos , piramide cepo 52 mm.156 . 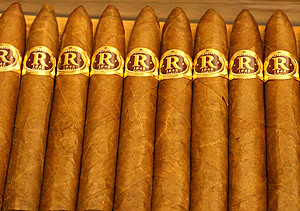 This cigar is a great alternative to the Montecristo No.2 , when you want a smoke is not too strong. The vitolario Vegas Robaina closes with Don Alejandro , a prominente cepo 49 mm.194 . A delicious cigar , well-made . It leaves blithely smoking , presenting a perfect and homogeneous combustion . If I may , I suggest to pair it with a bottle of Champagne Billecart Salmon. 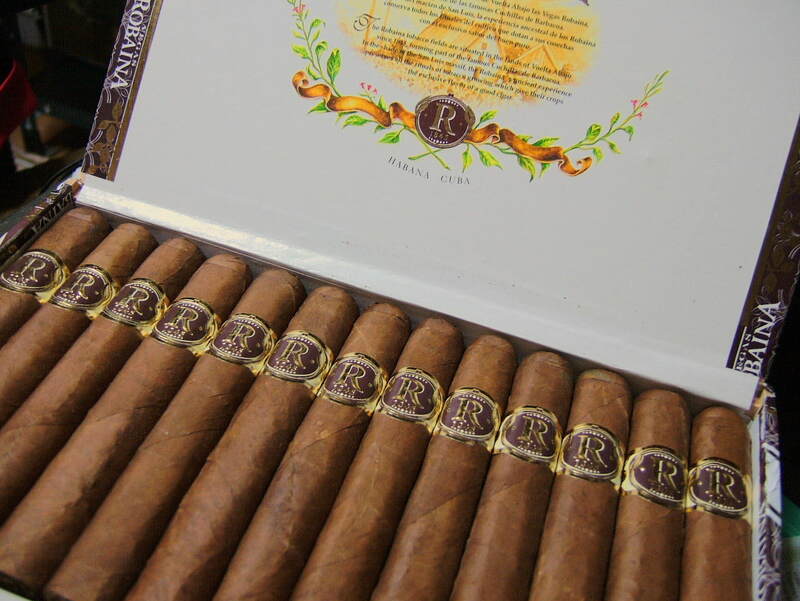 All Vegas Robaina cigars come in boxes of 25 units and are produced Totalmente a Mano with Tripa Larga. In the world of Cuban cigars I took off a lot of satisfaction . I have two great regrets and one is to be not able to meet Alejandro Robaina , during one of my many trips to Cuba. 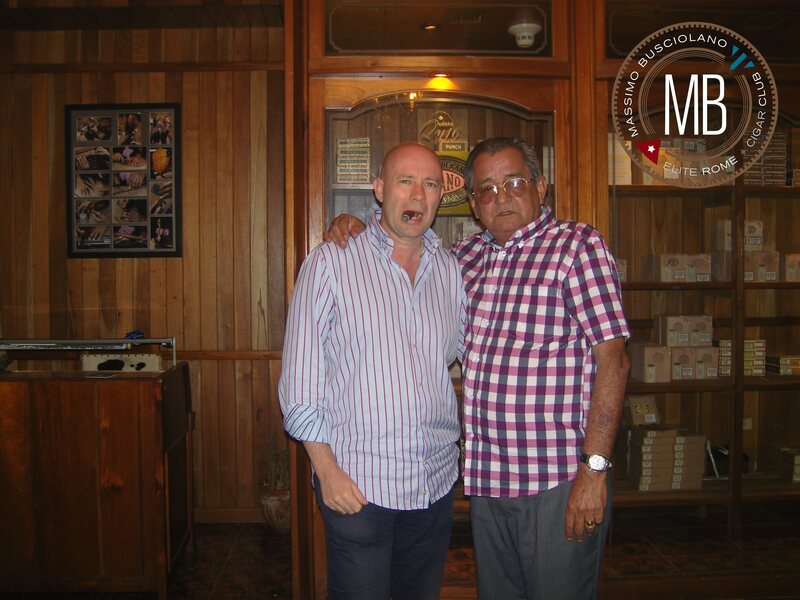 I have only recently met Carlos Robaina , gentle and concrete man, prerogatives that only the great men have. Dal 1845 la famiglia Robaina produce un eccellente tabacco nella sua piantagione di Cuchillas de Barbacoa, che si trova nel distretto di San Luis, della zona produttrice di Vuelta Abajo. La marca Vegas Robaina nacque nel 1997, come omaggio a tutti i coltivatori cubani nella figura di Alejandro Robaina, per aver raggiunto un alto rendimento durante il passare degli anni. Infatti nella finca Robaina vengono prodotte le migliori foglie per la capa. Vegas Robaina venne presentata in anteprima, in Spagna, poi fu estesa agli altri paesi. L’anilla rimane bene in mente in quanto presenta una R di colore oro su campo marrone. Il primo che incontriamo è il Famosos, un hermoso n.4 con cepo 48 per mm.127. Un sigaro non troppo forte, adatto anche per essere fumato in tarda mattinata. Il Familiar è un corona, cepo 42 per mm.142, per fumatori che amano moduli eleganti. Il Clasicos è un cervante, cepo 42 per mm.165. Questo sigaro merita molta attenzione in quanto pur non essendo un formato che va per la maggiore, è una fumata eccezionale. Uscite dagli schemi e provatelo, poi mi direte. Andiamo sui formati top e parliamo dell’Unicos, piramide di cepo 52 per mm.156. Questo sigaro è un’ottima alternativa al Montecristo n.2, quando si desidera una fumata non troppo forte. Il vitolario Vegas Robaina si chiude con il Don Alejandro, un prominente di cepo 49 per mm.194. Un sigaro squisito, di ottima fattura. Si lascia fumare spensieratamente, presentando una combustione perfetta ed omogenea. Se posso permettermi, suggerisco di abbinarlo ad una bottiglia di champagne Billecart Salmon. Tutti i sigari Vegas Robaina si presentano in scatole da 25 unità e sono prodotte Totalmente a Mano con Tripa Larga. Nel mondo dei sigari cubani mi sono tolto molte soddisfazioni. Ho due grandi rammarichi ed uno è quello di non essere riuscito ad incontrare Alejandro Robaina, durante uno dei miei tanti viaggi a Cuba. Solo di recente ho incontrato Carlos Robaina, uomo mite e concreto, prerogative che hanno solamente i grandi uomini. 6 Responses to "“Vegas Robaina„"
Can I made my next Robaina Book that U story? Thank you Jukka…I will be honored. 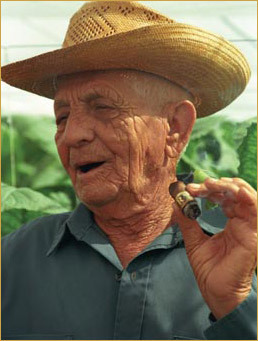 I am honoured that you have used my photo of Don Alejandro Robaina holding the tobacco seedling. It is one of my favourite photographs, of the many, that I took of him between 1998 and 2009. However, I must ask that you extend me the courtesy of crediting my photograph to me with my full name.